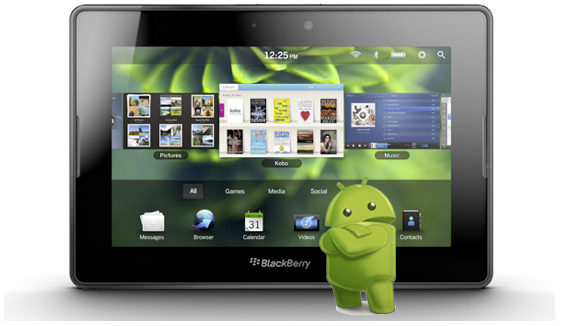 We all have been anxiously awaiting the BlackBerry PlayBook OS2 update to roll out and one of the key features in anticipation is the Android App Player. We have previously taken a look at it when it leaked out and it left us wondering more about the details, what it would run, what is compatible and how it will all work. Overseas there is an event taking place this week called Droidcon at which some RIM engineers shed some light on some of the details, breaking down what would work and what wouldn't. While some people will think that any type of restrictions are negative and that it is purpose defeating, take a minute to realize that this is an App Player that is running on a seperate platform, it isn't going to bring you a full Android experience. That said, widgets and live wallpapers, and apps that rely on Google Maps integration or make use of in-app billing will not run. Applications which are built using the Android Native Development Kit (NDK), using SIP or VOIP SIP and cloud-based messaging services will also not be able to run due to restrictions of the Android player. Take it as you will but it is a sign of good things to come. More information surfacing means that RIM is probably closer to release, as they have official information about it, and are willing to share more information about exactly how it will work. So, does this news disappoint you, or was this basically what you expected to see?